The master of the monstrous... the discoverer of the unconscious. Hieronymus, or Jerome, Bosch, b. c.1450, d. August 1516, spent his entire artistic career in the small Dutch town of Hertogenbosch, from which he derived his name. Bosch was a member of the religious Brotherhood of Our Lady, for whom he painted several altarpieces for the Cathedral of Saint John's, Hertogenbosch, all of which are now lost. The artist probably never went far from home, although records exist of a commission in 1504 from Philip the Handsome (later king of Castile), for a lost Last Judgment altarpiece. None of Bosch's pictures are dated, although the artist signed many of them. 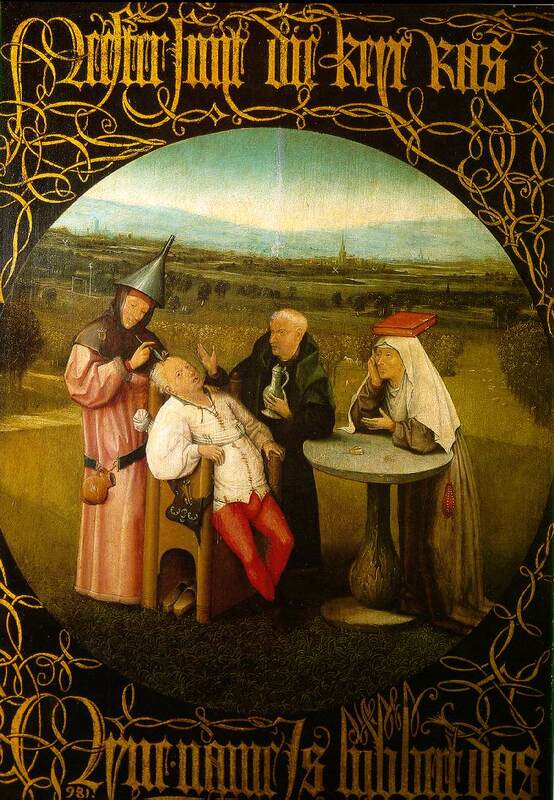 Removing "stones" from the head was a fairly common medieval operation; however, for some reason Bosch has painted a flower as the object being removed. The extraordinary painter Hieronymus Bosch (c. 1450-1516) stands apart from the prevailing Flemish traditions in painting. His style was unique, strikingly free, and his symbolism, unforgettably vivid, remains unparalleled to this day. Marvellous and terrifying, he expresses an intense pessimism and reflects the anxieties of his time, one of social and political upheaval. Very little is known about Bosch, which somehow seems fitting since his work is so enigmatic. We know that he adopted the name of the Dutch town of s'Hertogenbosch (near Antwerp) as his own, that he belonged to an ultra-orthodox religious community called the Brotherhood of Mary, and that in his own day he was famous. Many of his paintings are devotional, and there are several on the theme of the Passion. He is specially famous for his fantastic, demon-filled works, one of which is The Temptation of St Anthony . Even a more naturalistic painting like The Path of Life contains sinister elements. Apart from the dog snarling at the poverty-stricken old man, and the animal bones and skull in the foreground, robbers attack a traveller in the background, and a gallows is visible on the skyline above the old man's head. The Path of Life is on the outer face of the wings of a triptych. The three inside panels display Bosch's tragic view of human existence, dwelling upon the triumph of sin. Man's exile from Paradise is shown on the left, the infinite variation of human vice in the centre, and its consequence--exile to Hell--on the right. 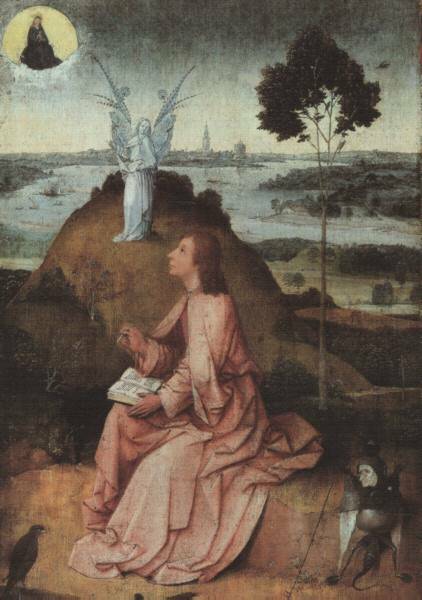 A great contrast to the painting by Memling is the one by Hieronymus (or Jerome) Bosch. He was a Dutch artist who lived somewhat later than Memling. His work was influenced by the Flemish school of painting. But whereas the Flemish painters created a world of serenity and reality, the world of Bosch is one of horror and imagination. His Vision of Tondalys both amuses and frightens us. We see a strange animal forcing a sharp stick through a large ear. A creature with a great head stretches open its mouth to show a table with people both behind and under it. A man caught in a big hat finds that one of his legs is sprouting roots. People fly through the air. In the background fire lights up the sky. We marvel at the extraordinary fantasy of the artist. We also feel that the man himself must have been very morbid to have been so concerned with pain. Although his pictures, with their weird animals and monsters, look as if they belong to the Middle Ages, they are not too unlike some of the paintings that are being produced today by painters who are called surrealists. They too paint a world of fantasy. Bosch lived at a time when the medieval period was giving way to a new age. His paintings undoubtedly reflect his concern for a changing world. Looked at in this way Bosch and his fantasies are curiously up to date. Photographs by Michael Shephard, Mark Harden and Carol Gerten-Jackson.